Disney movies are known for not only their visual style but their lyrical appeal allowing for a small space for audio description. Through analyzing the representational work, I recognized the issues of movement and artistic design within the Disney movies were often untranslatable which made it very difficult to reach the same authenticity of the original intended experience. 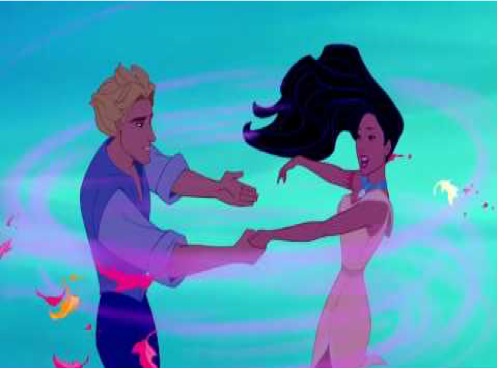 Using only auditory senses as a way to interact with the Disney movie, “Pocahontas,” I began to notice the lack of description of movement with the “Colors of the Wind” scene. Visually, “Colors of the Wind” uses a multitude of colors, animals, and landscapes. Although the music, in itself, presents a few audio indicators the overall vibe and texture of the film is lost. The spaces in between the song and audio breaks was not enough to fully gather visual information that was lost throughout the audio description. The hyper-visual of the piece does not allow the user of audio description to gather the same experience that those using their visual sense do. One of the lines from the audio description at the end of the song describe the scene as “hand in hand Pocahontas and John are facing each other, their heads close together…his musket and helmet lie abandoned on the grass” (Pocahontas). The central part described in the scene, the musket and helmet, is not the visual center but is described as one by disregarding the visual experience of Pocahontas and John amongst the trees and colorful leaves. The artistic value, therefore, is lost in translation due to the entertainment infrastructure being built on the able-bodiedness perspective which affects what is delegated within the audio description. The priority of the description should be a frame by frame question of ‘what makes this scene worthy if it stands alone” and using the most frequent answer as what should be described. Some of the breaks of the audio, where audio description is able to fill, matched breaks in the visual content which are rather non-stimulating in comparison to the scenes where the audio design is too busy to be simultaneously described. I believe, within those breaks, the audio should present the most valuable scenes from the whole visual experience that can effectively match the aesthetic of the intended experience. The formation of the audio description should more haptic language stressing the movement and texture as the primary descriptive technique. Disney movies must reconsider the small space for audio description and reevaluate the essential elements that make up the scene and question how it affects the overall experience.